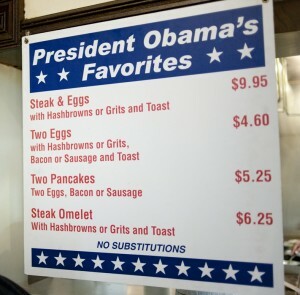 Obama, a local hero, is a favorite at Valois. I went to Barack Obama’s favorite diner, Valois, before I left Chicago. 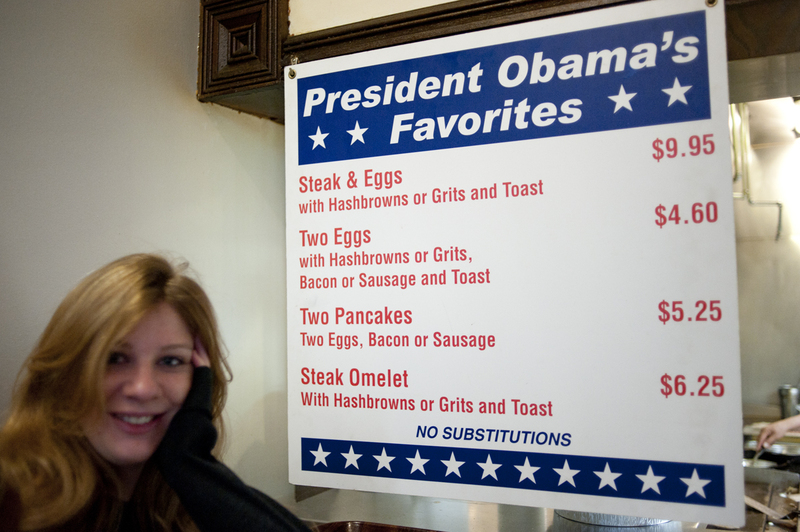 It was too cool — there were photos of him all over the place, smiling alongside the owner, and a big poster of his “favorite things to order.” Apparently bacon, eggs, and pancakes were one of his choice combos. Some Obama favorites. No substitutions! The waiter, John, told me Mr. Obama used to come in all the time before he was president and is a really nice guy. But these days, when he’s in Chicago, he normally gets his best friend to swing by and pick up a takeout order. He said the last time Obama himself came by, a year or so ago, it was like having a rock star in the joint: it took him 45 minutes to get from the front door to the cash register because he was mobbed by so many people on his way. Can you imagine that? You’re starving. All you want is a slice of bacon. And you’ve got to shake hands with a hundred people first. That’s patience. 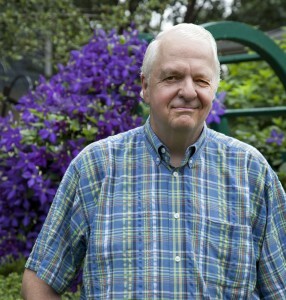 John says the only thing that’s changed about Obama since he became president is the color of his hair. He’s gone more gray. 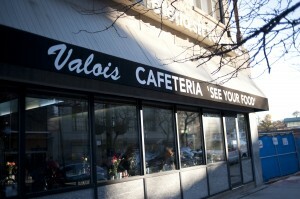 For your information, the food at Valois is simple, straightforward American grub. You order your food at the counter and it’s on your tray within minutes. The service is fast, and the clientele seems like a local crowd. When I was there at 7:30am, the place was packed. Among the crowd was a big table of eight or nine middle-aged men eating bacon and eggs, two little old ladies chatting in the corner, and a lone woman working her way through a giant omelet. 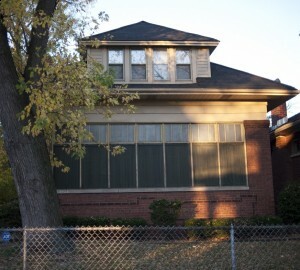 I also stopped at the Chicago home of the president, first lady Michelle Obama, and daughters Malia and Sasha. It’s a huge red brick house in the affluent neighborhood of Kenwood, with a big back yard. The whole block is cordoned off for security. Apparently people who live on his block have to sign all their guests in and out with the Secret Service. 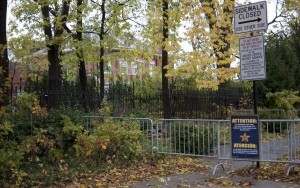 You can just glimpse the Obama home beyond the barriers and through the trees. But South Chicago neighborhoods can be very different from each other. The house where first lady Michelle Obama grew up isn’t far away, in the middle-class, predominantly African-American neighborhood of South Shore. Michelle Obama spent her formative years here. The house looks big, but the family of the girl who was then Michelle Robinson lived only in the upstairs section, renting an apartment from an aunt who lived downstairs. Michelle and her brother Craig shared a bedroom in their modest lodgings. Their father worked for the city water plant, and their mother took up secretarial work once they reached high school. But despite humble beginnings, Michelle was an excellent student. She followed her brother to the prestigious Princeton University and proceeded from there to Harvard Law School and the Chicago office of international law firm, Sidley Austin, where she met future husband and president, Barack Obama. Since then, despite her law degree, she has built a career on advancing social causes, a focus she brought to the White House in 2009. She has launched the “Let’s Move!” campaign to encourage young people to exercise and has established a “kitchen garden” at the White House to encourage healthy eating. All in all, the little girl from South Shore has turned out to be an inspiration. Ed Pyle asked why I give distances in kilometers. Many times I’ll follow with the distances in miles, in parentheses, but that can be awkward in the podcast spoken version of the blog. The reason why I use metric, either exclusively or in first reference, is quite simple: VOA is an international news organization, the Web is worldwide, and most of our audience, including English speakers, lives abroad, where metric overwhelmingly dominates. I recognize that I also have loyal readers in the United States, but the blog is primarily intended to tell the world about life in the United States, not to tell my fellow countrymen about our own land. Frankly, I hope my stories are compelling enough that anyone, anywhere, would read and appreciate them, but since our reach is global, the globe’s units of measure must take precedence.